Please welcome Let's Go Fly a Kite, who has graciously permitted me to repost her recent blog post creating a colorful wreath with recycled materials in honor of Earth Day! 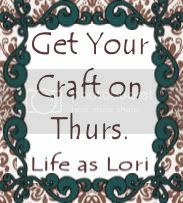 This crafty Toronto mom, wife & attorney writes a fun blog about her adventures in life, crafts, food...you name it. Thanks for sharing, KJ! 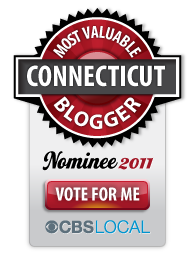 Next week (or maybe earlier) I'll post some of the local activities celebrating Earth Day in Connecticut. 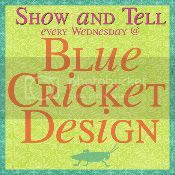 The Crafty Crow is sharing a number of eco friendly crafts in celebration of Earth Day. Yesterday, the Crow asked what can you make out of cardboard? This is our cardboard project - a whimsical wreath project which is great for kids. 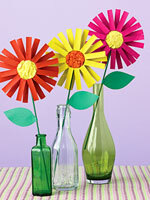 I was inspired by these flowers made out of recycled paper tubes onParents (by the way, there are some fabulous crafts for kids on this site too). 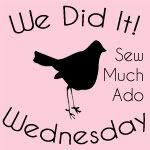 Thanks for stopping by and be sure to check out all the great projects at Tea Rose Home, Sew Much Ado and Show and Tell at Blue Cricket Design, and Life as Lori - just click the buttons below! I love this! I never thought of doing that with the 6 million paper towel and toilet paper rolls we have around. Too cute. Thanks for sharing! The Big 4-0! Earth Day is 40!